Mammalian cells produce a wide range of protein filaments with very different tensile properties such as neurofilaments that can be pulled to more than three times their original length. 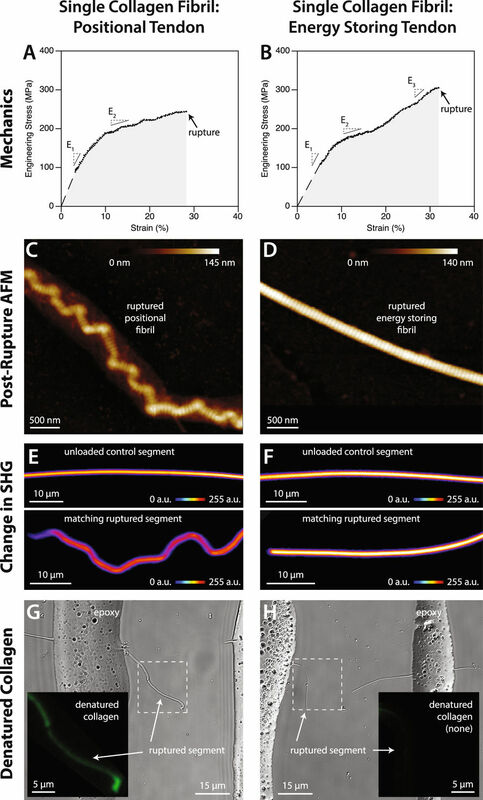 Our group is interested in measuring the stress and strain relation of these filaments as well as their viscoelastic response and potential structural changes using manipulation techniques. Currently most of our work focuses on collagen fibrils the main load bearing element of skin, tendons and bones. Areas of interest include, the influence of covalent crosslinks on collagen fibrils mechanical properties, mechanically induced collagen denaturation and inhomogeneities along collagen fibrils (below).